Hearthstone has been teasing an announcement of new cards, and we figured it would come at Blizzcon 2014. 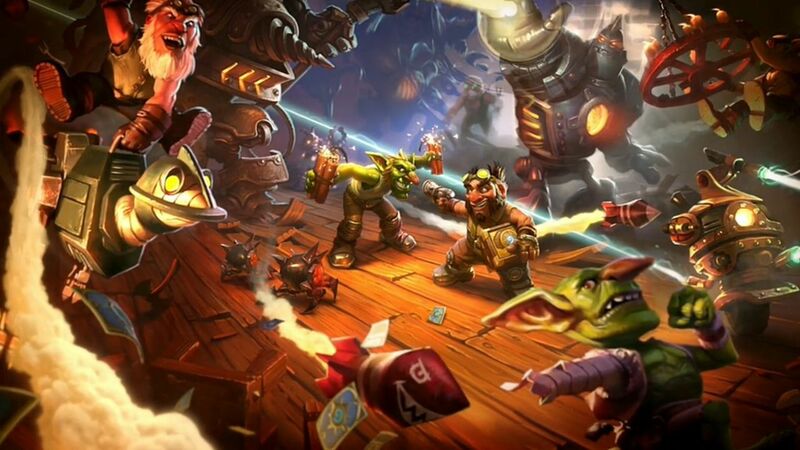 Sure enough, Blizzard has revealed the game’s first proper expansion,Goblins vs Gnomes. Curse of Naxxramas was the game’s first influx of new cards but Blizzard calls it a “single player adventure.” It also provided a much smaller number of cards than Goblins, 30 to this expansion’s 120. It focuses on the rivalry between engineers of the goblin and gnome varieties. The expansion will add a new minion type, mechs. There will be both neutral and class specific, so players can welcome Hearthstone’s robot overlords in a number of ways. The expansion is headed our way in December for PC, Mac and iPad. Players will be able to purchase packs with in-game gold or real money. As with Curse, the cards will be available in Arena mode whether you personally have them in your collection or not. Hearthstone has been a smash hit for Blizzard, turning the heroes and villains from World of Warcraft into digital collectible cards. It’s free-to-play, but plenty of players are willing to plunk down some cash to buy more packs. Curse was a shot to the metagame, but a full expansion will offer up even more possibilities.